The regiment was raised on 16th March 1689 by Henry 4th Baron Herbert of Chirbury. Originally recruiting from the counties of Montgomery, Radnor and Shropshire and assembled at Ludlow. After 3 weeks Henry resigned his Colonelcy in favour of his cousin Charles Herbert. William III needed troops to fight James II who had recently landed in Ireland with French troops. On 1st July 1690 the regiment fought in the Battle of the Boyne, it was also involved in the Capture of Waterford, the Siege of Limerick, the Siege of Athlone. It was also involved in the decisive battle at Aughrim on 12th July 1691. The regiment was next involved in the War of the League of Augsburg (nine years war) in 1695. On 2nd July it took part in the siege of Namur which was to become it’s earliest dated battle honour awarded in 1910. The regiment fought in the War of Spanish Succession at Schellenberg and in August 1704 at the Battle of Blenheim. It was also involved in battle at Ramillies, Oudenarde, the siege of Lille and Malplaquet. In 1712 the regiment was titled Royal and in 1714 became His Royal Highness The Prince of Wales’ Own Royal Regiment of Welch Fuzileers and the Prince of Wales feathers, Red Dragon rampant and rising sun emblem were added to the colours. Shortly after it was decided to number the regiments in order of precedence and the regiment was given the number 23. The regiment next saw service in the War of the Austrian Succession fighting at the Battle of Dettingen in June 1743 this was the last battle where a reigning monarch led his army and after the victory the regiment was allowed to add the white horse of hanover to its colours, it also fought at the Battle of Fontenoy in May 1745. The regiment next took part in the Seven Years’ War. Where it fought at Battle of Minden in August 1759 (for which it received the battle honour in 1801), the Battle of Warburg in July 1760, the Battle of Kloster Kampen in October 1760 and the Battle of Wilhelmsthal in June 1762. With the outbreak of revolutionary war in France the 23rd were sent to the French colonies in the West Indies in 1793/4 returning to Britain in 1796 after suffering greatly, more from disease than battle. In 1798 a detachment took part in the raid on the Bruges-Ostend canal, and the Helder expedition the following year which ended disastrously with the sinking of the transport ship the Valk and the loss of 241 men of the 23rd . 1801 saw the 23rd at Aboukir Bay and Alexandria which added the battle honour Egypt and the badge of a Sphinx on the colours. In 1805 the 1st battalion joined the expedition to Cuxhaven and in 1807 took part in the raid on Copenhagen where the Danish fleet were captured. The 1st battalion sailed to Nova Scotia in 1808 and later that year reluctantly returned to the West Indies where in 1809 fought at Martinique which became another battle honour. The 2nd battalion was sent to Spain and experienced the retreat to Coruna in 1808/9 where it became the last troops to leave the city and locked the gates taking the keys with them which are still in the regimental museum to this day. 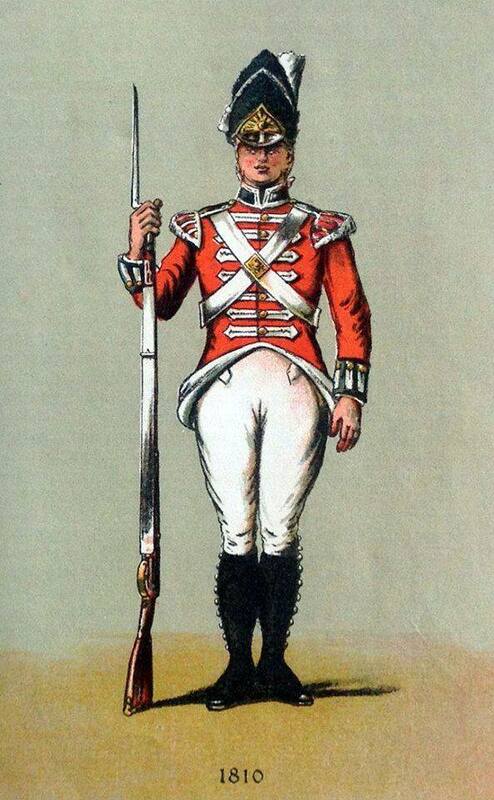 The 2nd battalion hereafter would stay in Britain as a recruiting battalion and the 1st battalion left Halifax Nova Scotia in late 1810 to take part in the Peninsula War the first action being at La Albuera in May 1811. In 1812 the regiment were at the sieges of Ciudad Rodrigo and Badajoz. In July 1812 the regiment fought in the victory at Salamanca. Later in 1812 they experienced the long retreat to Portugal which saw more than half their number reporting sick. However after the winter and spring rest they once more marched into Spain and in June 1813 fought at Vittoria. The 23rd took part in the Battle of the Pyrenees, the battle of Nivelle in November 1813 and Nive in December 1813. In the new year the 23rd were at the battle of Orthes in February and in April 1814 were at the final battle of the war at Toulouse. After the war the 2nd battalion was disbanded and their number added to the 1st battalion stationed at Gosport. However the 1st battalion found itself on route to Belgium in March 1815 as Napoleon had escaped from Elba and was once more building his army. In June 1815 the regiment was at Waterloo where it suffered heavy artillery fire and many cavalry attacks and amongst the casualties was Colonel Sir Henry Ellis KCB who had commanded the regiment for eight years and suffered eight wounds during that period. The 23rd’s Light Company took part in the last action of the Napoleonic wars at Cambrai on 24th June 1815. In October 1815 the Adjutant –General issued pay books to all ranks and the example name given was Private Thomas Atkins 23rd Regt Foot. This is where the slang for a british soldier being “a Tommy” or Tommy Atkins comes from. Following Waterloo the regiment took part in the occupation until 1818, after which it saw tours in Ireland, Gibraltar, Canada and once more in the fever ridden West Indies. In 1854 the 23rd joined the war in the Crimea fighting at Alma, Inkerman and Sevastopol. 1857 saw the Regiment at the relief of Lucknow. Through the rest of the 19th and early 20th centuries the Regiment went on to serve in India, Africa, China, Hong Kong and Burma as well as Ireland, Crete, Malta, Gibraltar and Canada. The 23rd served in the Great War including Mons, the Somme, and Paschendale but at that time there were approximately 40 battalions attributed to the 23rd so their service is far too numerous to list here. The 23rd were also active in the Second World War in many theartres including Europe, Madagascar and Burma. The Regiment saw service after the war until 2006 when it became the 1st battalion Royal Welsh.